Keep your credit cards and personal identification close to you at all times with this card holder. 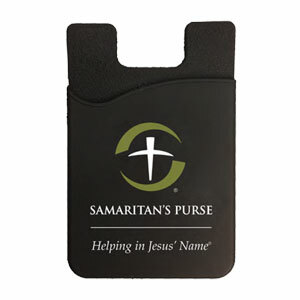 Made with flexible silicone and bearing the Samaritan’s Purse slogan “Helping in Jesus’ Name,” it has adhesive pads that attach to the back of your cell phone. The result is a slim, convenient way to carry the essentials with you while traveling, hitting the gym, or hiking a trail.